Myra Hudson's (Joan Crawford) life is perfect: she’s a successful and wealthy playwright and actor Lester Blaine (Jack Palance) has just about nabbed the lead role in Myra’s newest play. Until Myra decides he isn’t romantic enough to actually play the role. She subsequently fires him and the play goes on to be a great success. Lester isn’t quite done with Myra and is determined to charm her himself. While on a train to San Francisco, Myra “coincidentally” encounters Lester. She’s all too eager to apologize for firing him and quickly falls victim to Lester’s charm and wit. Eventually, the two get married and things seem to be going perfectly. That is until Irene Neves, Lester’s mistress, enters the narrative. Suddenly, a plot to murder Myra for her wealth unfolds and insanity and chaos ensue. Unlike other Film-Noir films, the good and the bad are clearly defined in SUDDEN FEAR. Crawford is enthralling as she plays the sympathetic Myra Hudson. It’s clear from the beginning that Myra has it all except for true love. She writes about the kind of love she wants and Myra thinks she has finally found in Lester. Blinded by idealistic notions of love and romance, Myra is unfortunately unable to see through Lester’s play acting. However, the viewer sees right away that Lester is nothing short of a creep. This is mostly thanks to Palance’s exceptional portrayal of a subtly disturbing albeit charming villain. He has a smirk that sends chills down my spine. Crawford and Palance are an exceptional duo and their unique facial features and nuanced expressions work seamlessly. Gloria Grahame gives a less than inspiring performance as Irene Neves and her character ends up being nothing more than a needed accessory. 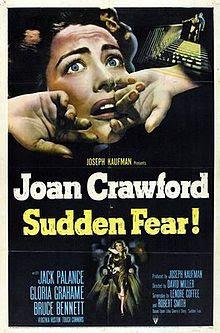 SUDDEN FEAR delivers exactly what the title promises. While Myra and Lester’s relationship may seem only slightly uncomfortable at first, things quickly turn on a dime. Suddenly, we’re thrown into a state of pure and nuanced suspense. An excellent noir with a powerful female lead. Is the ultimate theme that not all powerful and successful women need men in their lives? That a man may in fact ruin what the independent woman has built? If so, it’s a powerfully radical message for a 1950s film. But it’s cleverly packaged into a suspenseful Film-Noir tugging at the interests of many diverse audiences. Ignoring that subtext is easy in the midst of a thrilling narrative. A noir lover? Don’t miss this one.